That big ball of light in the sky is harming much more than your poor, unprotected skin. Asphalt, though seemingly tough and durable, can be damaged from the strong UV rays that the sun emits. Unfortunately, your driveway or lot can’t always escape the unremitting stream of light coming from the sky. But, you can protect it. Similar to how we apply sunscreen before going outdoors, sealcoating, a service that American Sealcoating & Maintenance offers, helps to protect your asphalt from the damage that UV rays could cause. We up in Illinois understand rain. And, since we understand rain, we also understand asphalt cracks. Unfortunately, due to pollution, the rain that’s been recycled and sucked back into the atmosphere just to be poured back onto us in the form of an intense, Midwestern storm, is acidified after combining with certain fossil fuel emissions. This change in pH, in turn, can break down your asphalt like there’s no tomorrow. Similar to protection against UV rays, a good sealcoating job can make all the difference. Call us today for a quote. While driveways and parking lots are designed with materials that can resist the weight of most vehicles, some heavy trucks can cause asphalt to crack under pressure… no pun intended. While you can’t always prevent heavy vehicles from coming into your driveways or lots, you can take certain precautions to help prevent damage before it comes. 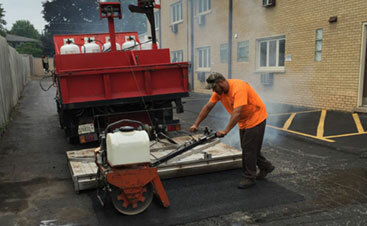 First, it’s so extremely important to make sure asphalt is installed properly the first time around. 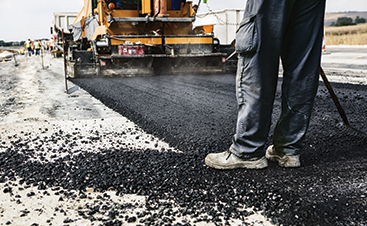 Depending on the environment and your expectations of how much your pavement is going to be used, the installation process and type of asphalt used could vary. If you’re a business or home that thinks that heavy vehicles will be making their way onto your asphalt, then consider utilizing 41B grade asphalt which is much more durable! Confused? Call American Sealcoating & Maintenance and we’ll give you some expert advice and a quote if necessary. Asphalt, most of the time, is made for vehicles. Vehicles, most of the time, run off of oil. 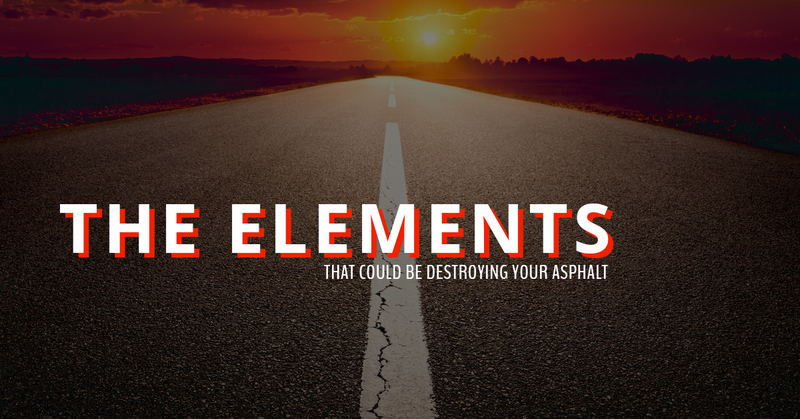 Unfortunately, asphalt and oil aren’t the best combination for a silky smooth driveway. While oil leaking out of your vehicle is sometimes hard to prevent, the cracks and damage aren’t as difficult. First and foremost, if you notice an oil spot on your asphalt, do your best to clean it up. Spraying the hose on the spot and scrubbing it with some dish detergent should do the trick, but it’s important to act quickly before the oil seeps through into the deeper layers of the asphalt paving. Additionally, and apologies for being repetitive, but sealcoating your asphalt driveway or parking lot could be your best ally against the damaging effects of oil. Winter in Illinois has never taken it easy on us, let alone our precious asphalt. First, the chemicals in rock salt used to help melt snow and ice can break down the bonds that hold the asphalt particles together. Not only does the rock salt corrode pavement, but the melted water that seeps into the damaged cracks could cause even more issues. Unfortunately, the common alternative to rock salt, which is paving, can cause scratches to the surface. While we can’t prevent piles of snow and ice, nor can we avoid the task of ridding our lots of the snow, we can take measures to help reduce damage. First, try to avoid using rock salt whenever possible. Second, try using a shovel made out of plastic or a less harsh surface to reduce the amount of scratches made to the asphalt. And, last but not least, consider sealcoating! The weather up in Illinois has never taken it easy on us and likely never will, but a quality asphalt installation and sealcoating job can make the difference between that annual (and expensive) repair job and a smooth and crack free driveway. 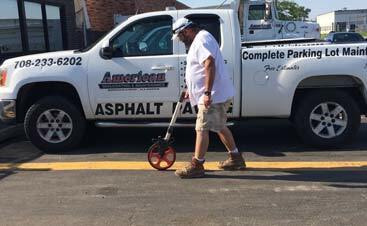 Luckily, we at American Sealcoating & Maintenance has all of the tools and expertise needed to get your asphalt ready for the extremities.